Now that the Pasta Pass has ended its glorious run, you might've assumed all the excitement had died down at Olive Garden. But the Italian chain still has promos up its sleeve, and this one is its most democratic yet. 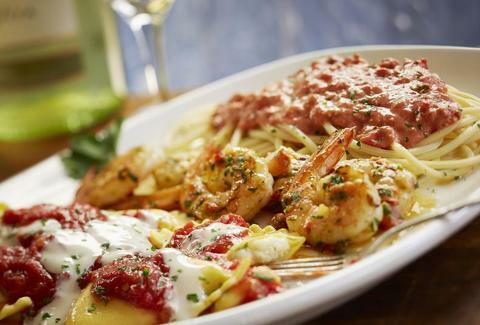 Right now at Olive Garden, you can try the new "Northern Tour of Italy" or "Southern Tour of Italy" samplers. The first group is pretty cheese-heavy, and features Asiago Tortelloni with Meat Sauce, Chicken Lombardy, and Fettuccine with Creamy Parmesan Portobello Sauce. Meanwhile, its rival is bigger on tomatoes and peppers, offering Mezzaluna Marinara, Spicy Pesto Shrimp, and Bucatini with Spicy Tomato Bacon Sauce. But only one of these samplers will join the permanent menu. In a move that's bound to confuse social media-savvy Civil War reenactors, Olive Garden is asking fans to vote for their favorites on Twitter or Instagram with #TeamNorth or #TeamSouth. They will also be counting purchases of either sampler as a vote, and if you participate, you might win a trip to Italy. Better get your vote in early, because it's only a matter of time before that Olive Garden champ comes in to stuff the ballot box. Kristin Hunt is a Food/Drink staff writer for Thrillist, and is #TeamChocolateLasagna. Follow her to discontinued desserts at @kristin_hunt.